I just want to remind people if you find you can’t make a comment in one of my posts it’s because someone spammed the comment section and I had to turn the comments off for that post. Once one spam appears, soon a ton follow, so I delete the spam and turn comments off. If I had newer software there would be other ways to deal with it, but I have yet to upgrade. Sorry. I have this fear that I will lose all my history if I upgrade. Must get past that. And I will, after the holidays and after I hand in this book, and finish the NPR piece. 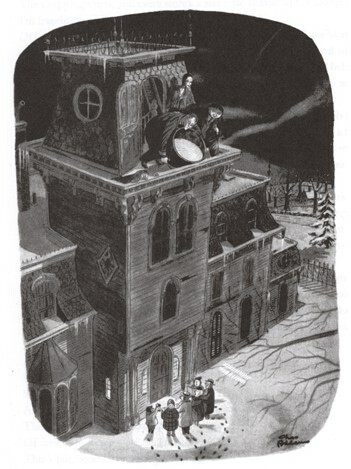 Meanwhile, I hope you enjoy this holiday Charles Addams cartoon. And please, do not try this at home. Or Brooklyn, where I will be caroling in a week or so for a good cause with friends. Okay, must get back to work. And TV. What’s on TV tonight? Anything? Oh, there’s a new Hallmark TV movie on tonight. Yes, I am a sucker for those Hallmark movies. I cry every year at the Hallmark card commercials, especially the retiring teacher one. And the one with the guy in the nursing home. I didn’t get out to photograph decorations today. I meant to take a picture of a dress that I long for that’s hanging in a window nearby, taunting me. Man oh man do I want that dress, even though I have no place to wear it.